As Washington debates the NAFTA-style deal with Panama, Wikileaks has released a treasure trove of damning documents about the current Panamanian administration. But with friends like Panamanian President Martinelli, who needs enemies? In January 2009, the Embassy expressed concern that Panama's authorities supposedly in charge of providing the U.S. with intelligence "failed to provide" information about drug-related money laundering "to the Attorney General as required by law. Ambassador stressed that the credibility and efficacy of the UAF were crucial in fight against money laundering." It gets worse. The man behind the money - David Murcia Guzman - has links to former Colombian president Alvaro Uribe, and current Panamanian president Ricardo Martinelli. According to this cable from March 2009, Martinelli's network of Super 99 stores may have been a "service provider" to Guzman, and may have laundered illicit proceeds. The Embassy wrote, "This scandal is a huge black eye for Panama, and could do serious damage to its international reputation as a safe place to do business. And the worst is far from over." As EOT regulars know, NAFTA-style trade deals contain investment rules that allow corporations to bypass national legal systems and launch attacks on governments in international tribunals. The basis for these attacks can be as simple as institution of a new environmental policy that affects the corporation’s expected future profits. Judges for these so-called “investor-state” cases are selected in part by the corporation, and the trade-pact rules are tailored to corporate demands. Often the mere threat of one of these investor-state awards can cast a chill on public-interest regulation. All told, more than $350 million has been paid to date in these cases. Moreover, there are over $9.1 billion in claims in the 13 investor-state cases outstanding under NAFTA-style deals, relating to environmental, public health, and transportation policy. An additional $483 million has been awarded under U.S. Bilateral Investment Treaties (BITs), which contain similar investment rules. Billions of dollars are also pending in BIT cases now underway. Some have suggested that this provision goes all or most of the way towards resolving the concerns with these provisions. This is not the case. There is no certainty as to the legal meaning of the May 2007 preambular provision. Public Citizen has just published a memo that examines six different approaches to preambular language, including the four that have been taken by the tribunals under the 45 final awards issued under U.S. FTAs and BITs. The memo finds the May 2007 preambular modification fails to address the main concerns raised by scholars and members of Congress with regard to the investment provisions. Indeed, there is scant historical support for the notion that pro-public interest provisions of preambles are protective of regulatory prerogatives: nearly 90 percent of the time, tribunals have given them no weight at all. The remainder of the time,tribunals found that pro-public interest provisions had to be balanced against, and possibly watered down by, pro-investor provisions. Deeper changes will be required to the investment provisions of the proposed FTAs with Korea, Panama and Colombia, as well as a Trans-Pacific FTA (which includes Peru, the U.S. and eight other countries) now under negotiation. To read the memo, go here. On Monday the Office of the U.S. Trade Representative (USTR) notified Congress that it would initiate negotiations with New Zealand, Chile, Brunei, Singapore, Peru, Vietnam, and Australia to form a Trans-Pacific Partnership (TPP). This is the first time that the Obama administration has formally initiated trade negotiations. Back in 2006, New Zealand, Chile, Singapore, and Brunei implemented the Trans-Pacific Strategic Economic Partnership Agreement (commonly referred to as the P4), which was originally designed to welcome new nations into the pact, gradually expanding a wider low tariff zone. After the Bush administration expressed interest in joining the pact in February of 2008, Peru, Vietnam, and Australia moved toward jumping on the P4 bandwagon. A statement by the U.S. Chamber of Commerce said it hopes the U.S. will join P4 and this would possibly lead, through a process known as “docking and merging,” to a version of the much-discussed Free Trade Area of the Asia Pacific. Negotiations begin in March of next year. The results are pouring in: when Congress voted to pass last year's NAFTA expansion to Peru, they effectively gave up leverage over a government determined to rip apart the Amazon and its biological occupants. "Hydrocarbon blocks now overlap 20 protected areas," said Cesar Gamboa, president of the Peruvian nongovernmental organization Derecho, Ambiente y Recursos Naturales. An analysis by Save America's Forests indicates that 58 of the 64 blocks overlay titled indigenous lands and 15 overlap the territories of indigenous peoples in voluntary isolation. Legislative decree 1,015, approved by García on May 20, makes it possible for indigenous communities in the country’s highland and jungle regions to authorise the sale or lease of communal land to private investors with the votes of just 50 percent plus one of the members of the community assemblies. The new law modifies legislation on private investment that required the consent of two-thirds of the qualified members of the village assembly to sell or lease land. Some warn that the decree opens the door to manipulation of communal assemblies. "The common practice of many companies has been to foment the creation of communal organisations parallel to the official ones, and to co-opt some of the local leaders, which has enabled them, in many cases, to destroy the social fabric and impose their own decisions," said lawyer Javier Jahncke with the non-governmental Ecumenical Foundation for Development and Peace (FEDEPAZ). Indeed, the action by the nominally socialist Garcia has brought together the left, the right, and indigenous groups in Peru to oppose the presidential power grab, and the multinational land grab. We'll look at more of this story today and next week. Folks in Montana are what? There has been a series of news items over the last few months that suggest that the presidential candidates are softening their trade positions just because they don't have a No to NAFTA symbol tattooed on their forehead. Here is one example from a few days ago, but there have been others that we've written about. Hillary Rodham Clinton and Barack Obama have been largely silent on the issue of free trade agreements as the primary season is set to end Tuesday in Montana and South Dakota, where agriculture and exports reign supreme. The article then references the support of Sen. Max Baucus (D-Mont.) and former Sen. Tom Daschle (D-S.D.) and some corporate ranchers for trade deals as evidence that these states are in love with the status quo. But this is ridiculous. As we've written before, "more exports" does not equal rural prosperity. In fact, often times the opposite is true, since prices matter more than volume. Recent trade agreements put our jobs and the viability of family farms and ranches across Montana in jeopardy by handing off trade advantage to foreign interests. Jon Tester will fight for Montana priorities in the U.S. Senate by standing firmly opposed to unfair trade agreements that hurt our communities and way of life. While Sen. Burns voted for tax giveaways to companies that outsource American jobs, Tester will protect American jobs in the U.S. Senate. Tester stayed true to his promise by voting against the NAFTA expansion to Peru last year. And you can bet that Daschle's spotty record on fair trade didn't help him any when the GOP ran a "social conservative" against him. If you want to set the record straight, check out on the real deal in Montana and elsewhere, check out our election report here. The Oregon Fair Trade Campaign rallies outside of the office of Rep. Darlene Hooley (D-Ore.), who has yet to take a position the Death Free Trade Agreement (aka Colombia FTA). “My goal is to get a robust TAA signed by the president and once that occurs I think we will be in a much better position on Colombia. ... Taking on these issues can clear the way I think for the pending trade agreements.”... Baucus admonished both labor unions and business groups in the speech. ... But AFL-CIO Policy Director Thea Lee... said that if President Bush introduces the Colombia FTA bill over the objection of the congressional leadership, it will be defeated for a number of reasons: the economy is in recession, it is an election year and there is a Democratic majority in the House and the Senate. In addition, the last election in the House saw 27 free trade representatives replaced with fair traders, she pointed out." It's true! More than 27, in fact. Check it out! According to Clyburn, Hoyer is “very supportive” of the agreement, but he is “not so sure that we got it at the point where we can get the full leadership to endorse it.” Everyone in the Democratic leadership voted for the Peru FTA, he pointed out. A Hoyer spokeswoman said Hoyer remains undecided on the Colombia FTA and said Clyburn did not accurately describe Hoyer’s position, however. Clyburn said he would work with other Democratic leaders between through next week in order to get the Colombia FTA “in shape” for a possible vote, explaining that he expects the administration to submit the implementing bill next week in order to have the maximum number of legislative days for a vote this year. UPDATE AT 11:50 AM - BUSH JUST SIGNED THE LETTER TO DROP THE FTA IN CONGRESS. WE'LL TRY TO FIND THE VIDEO... FUNNIEST PRONUNCIATION OF "URIBE" EVER. "believe now they they can extract significant concessions from the White House for passing the FTA. A Democratic lobbyist said these members have made it clear the concession has to be “enormous” to offset the negative fallout from passing the Colombia FTA, and the lobbyist said their demands have been further prompted by President Bush’s rejection of programs that were a priority for Democrats, such as the State Children’s Health Insurance (SCHIP) bill." "I don't think dealing with the dislocation that comes from trade gets you one additional vote for a trade deal that is flawed," said Bill Samuel, legislative director for the AFL-CIO, a fierce opponent of free trade agreements. "The problem with Colombia - overlay the economic concerns with the human rights issue, the murders, the death squads, the lack of prosecutions. TAA doesn't address any of that." According to [a Democratic] aide, a more reasonable trade-off for the Colombia FTA could involve a second economic stimulus package focusing on the middle class, mortgage relief for home owners threatened by foreclosure due to the sub-prime mortgage crisis, increased federal funding for education and the passage of an SCHIP bill... [but] union sources also said they have been assured by the speaker’s staff that no deal is being struck that would allow the FTA to come forward. While all this air time is getting sucked up by the Colombia FTA - a policy not yet in place - the negative impact of current policy realities like our China trade deficit is not being addressed. But that doesn't mean fair traders aren't having to play whack-a-mole on these other issues as well. According to IUT, AFL-CIO Industrial Union Council Executive Director Bob Baugh "ruled out that administration action on China would make the House leadership more inclined to let the U.S.-Colombia free trade agreement come up for a vote. “We had assurances from leadership that trying to make linkages [to advance the Colombia FTA] is a false start,” he said." ...At the end of 2007, angered by the strong opposition of the majority of Afro-Colombian communities to the U.S.-Colombia Free Trade Agreement (FTA,) Uribe created a new Commission in Colombia that directly challenges our legal governance structure. Cynically dubbed the Commission for the Advancement of Afro-Colombian People, it would undermine our communities’ ability to advance development strategies chosen by our people that comport with our needs and that help even the economic playing field... President George Bush and other U.S. Uribe allies, such as Rep. Gregory Meeks (D-NY), and the vast array of lobbying firms hired by the Uribe government are now trying to tout this outrageous Commission as evidence that Afro- Colombian concerns are being addressed as they push to pass the FTA. Córdoba says that thanks to a vibrant civil society movement in the 1980s, Afro-Colombians enjoy full legal recognition of their cultural rights and collective ownership of their lands (he specifically mentions Law 70 of 1993 (PDF), a rather remarkable piece of progressive legislation that I'd encourage anyone to read). Yet this recognition has been undermined by paramilitary organizations forcing Afro-Colombians off of their land: "Tens of thousands of us have been forced to flee... clear[ing] the way for the entry of oil palm plantations, logging operations, and mining projects advanced by allies of the Uribe Administration." The Colombia FTA's Chapter 10 contains the same poisonous investor rights provisions as NAFTA, CAFTA and the Peru FTA. If the FTA is implemented, these provisions will only exacerbate the situation, empowering foreign companies to engage in resource extraction made possible by the illegal and often violent forcing of Afro-Colombians off of their land — land supposedly guaranteed to them by Law 70. Today, at an event at the Council of the Americas, a corporate organization, I was introduced to a delegation of corporate CEOs from Colombia: David Bojanini of South American Insurance, Manuel Carvajal of the Carvajal Corp., Antonio Celia of Promigas and Francisco Diaz of the Corona Organization. The event was introduced as a discussion of whether the "free trade agreement" would help improve Colombia, but amongst the diverse panel made up entirely of CEOs of Colombia's corporations (but from different geographic regions, perhaps? Though not even sure about that...), no one said that the FTA would be a bad idea, omitting the perspective of most civil society groups in Colombia and not leading to much of a discussion. After going on about all the contributions of what they admitted was not a representative sample of Colombian CEOs, Francisco Diaz strained to say, "we're trying to tie this into the FTA..."
The CEOs were also excited to announce that they were adopting a few conventions of a Human Rights Code of Conduct that they had written. I would think that since they wrote it they would sign up for all of it, but apparently some of the private-sector written Human Rights Conduct just went too far in supporting human rights. Although not one U.S. labor, environmental, Latino, consumer, faith or family farm group supported the Peru free trade agreement (FTA), a majority of Senate Democrats today broke with their base, dismissed widespread public opposition to more-of-the-same trade policy and joined Republicans to deliver another Bush NAFTA expansion to the large corporations pushing this deal. The debate in the Senate contrasts with that in the House of Representatives last month. There was little focus on the Peru NAFTA expansion deal in the Senate, but in the House an intense, multi-month debate resulted in a majority of House Democrats, including 12 of 18 House committee chairs, voting against the Peru pact and signaling that it is not an acceptable model for future trade agreements. The breakdown of this vote vividly demonstrates two phenomena: the distance between most senators and the American public on trade issues, and the depth of the American public’s negative opinion about NAFTA-style trade deals. All but two of nine Democratic freshmen senators who recently campaigned extensively in their states opposed the Peru NAFTA expansion today. Most of the Democratic presidential candidates oppose it, including Sens. Joseph Biden of Delaware and Chris Dodd of Connecticut. In contrast to most of the Democratic presidential candidates who oppose the Peru NAFTA expansion, Sens. Hillary Clinton of New York and Barack Obama of Illinois support it. Clinton and Obama’s support for the Peru FTA – after both opposed the 2005 Central American Free Trade Agreement (CAFTA), which contained identical provisions and now campaign against NAFTA in Iowa, should make voters wonder just what sort of trade policy Clinton and Obama really support. None of the senators running for president voted today, although all four have issued public statements taking positions on the Peru pact. Clinton’s support for the Peru FTA suggests that her recent call for “a time-out” on trade agreements apparently begins only after she votes for one more NAFTA-style agreement. The fact that Obama was the first Democratic presidential candidate to announce his support for the Peru NAFTA expansion two months ago makes his recent attacks on Clinton regarding NAFTA bizarre. Neither Clinton nor Obama has made clear which of the objectionable NAFTA foreign investor privileges – imported food safety limits, service sector privatization and deregulation, “Buy America” bans and other provisions – would be eliminated in potential Clinton or Obama-negotiated agreements. Voters across the country who have suffered the real-life damage from NAFTA deserve to know how all this anti-NAFTA talk from Clinton and Obama would translate if either were elected president. In key early primary states, Sen. Tom Harkin (D-Iowa) and both Iowa freshmen Democratic House members opposed the Peru NAFTA expansion, as did both New Hampshire Democratic House members. That the Senate passed a NAFTA-style trade agreement by a wide margin is not unexpected, as even the highly controversial NAFTA had 61 in favor, including 27 Democrats, in 1994. The Morocco and Bahrain FTAs were passed by voice vote in 2004; 80 senators voted for the Australia FTA also in 2004; 83 voted for China permanent normal trade relations in 2000; the Singapore FTA in 2000 obtained 66 votes; and the Chile FTA got 65. In 2005, CAFTA, which obtained no votes from numerous prospective Democratic presidential candidates who had never before opposed a pact, was the closest Senate trade vote ever at 54-45. The passage of the Peru FTA, which was overwhelmingly opposed in the United States and Peru, is bad foreign policy, bad domestic policy and egregiously bad politics. Both of Peru’s labor federations, its major indigenous people’s organization and its archbishop called on the U.S. Congress to oppose the deal based on the damage it is projected to cause Peru’s small farmers and environment. The Peru NAFTA expansion replicates many of the CAFTA provisions that led most Democratic senators to oppose that pact. This includes: foreign investor privileges that create incentives for U.S. firms to move offshore and expose basic environmental, health, zoning and other laws to attack in foreign tribunals; bans on “Buy America” and anti-offshoring policies; limits on food import safety standards and inspection rates; and NAFTA-style agriculture rules that are projected to displace tens of thousands of Peru’s Andean farmers and thus increase coca production and immigration. The pact also contains terms that could subject Peru to compensation claims for reversing its unpopular Social Security privatization, the same system Democrats fought against at home. Repeated polling shows that the American public, both Democrats and Republicans, have negative feelings about current U.S. trade policies and the effects on their lives. Democrats in 2006 gained a majority in Congress with scores of candidates winning in campaigns focused on changing the NAFTA trade model. The message of the midterm elections was loud and clear: Voters want a new direction on trade. Congress’ public approval rating will not be helped by ignoring this call and passing another Bush NAFTA expansion. Senate Majority Leader Harry Reid (D-Nev.) was one of 16 Democrats voting against the deal. “But I still see many holes in U.S. trade policy that need to be filled,” Reid added. 3:29 pm: Full analysis forthcoming, but the majority of leadership and freshmen opposed (minus not surprisingly Ben Cardin from Maryland and VERY surprisingly, Jim Webb of Virginia, hitherto MISTER Inequality). None of the candidates for president even voted, including Clinton, Obama and McCain, who were for; and Biden and Dodd, who were against. 1:22 pm: There is a bit of life here at the liveblog. There's an agreement to not have more debate and just come in for a vote at 2:15 pm. So we'll know within the hour. 11:42 am: Yeah, we're asleep at the wheel, sorry. Sen. Max Baucus (D-Mont.) just said "Peru is no ordinary country, and the Peru FTA is no ordinary trade agreement." Given Baucus' relentless advocacy for expanding NAFTA to additional countries in opposition to his party's base, Max Baucus is no ordinary senator. So, we didn't miss much from the Senate debate, as it turns out, which will begin anew shortly after 10 am, and the vote is still scheduled for 2:15 pm. Sen. Ken Salazar (D-Colo.), who voted right on CAFTA and wrong on the Oman FTA, argued that: "coca production, a major concern of ours with respect to Peru, has decreased dramatically, thanks in large part to the eradication, interdiction, and other efforts to develop economic opportunities for the Peruvian people." He appears to be talking about in relation to the 1990s, but as this estimate by the Department of Justice shows, "Coca cultivation in Bolivia and Peru has the potential to increase significantly and to replace some of the decreased cultivation in Colombia: Cocaine production in Bolivia and Peru is at a much lower level than in Colombia. However, illegal coca cultivation has increased to its highest level in 5 years." And as the Economist reported, social movements in Peru are mobilizing to promote even further coca cultivation. After 55 years of packing Eastern Washington asparagus, the Del Monte Foods factory here moved operations to Peru last year, eliminating 365 jobs. The company said it could get asparagus cheaper and year-round there. As the global economy churns, nearly every sector has a story about American jobs landing on cheaper shores. But what happened to the American asparagus industry is rare, the farmers here say, because it became a casualty of the government's war on drugs. It's not for nuttin that the Washington Office on Latin America and our office argued that the coca-trade connection is the opposite of the one Salazar argued on the floor yesterday: NAFTA-style trade policies lead to RURAL DISPLACEMENT, which means immigration or pursuit of illegal drug cultivation. These and other arguments (about food safety and ag policy more generally) are made forcefully by a letter sent yesterday by family farm groups to the Senate on the Peru FTA. 5:18 pm: Sanders conceding that NAFTA has been good for some Mexicans... well, one. Carlos Slim, the world's richest man. 5:14 pm: "If you like NAFTA, you'll love the Peru FTA. Most people in America don't like NAFTA." 5:01 pm: By way of a little advance warning, I am probably going to head home within the next hour (got stuck overnight in Chicago last night, am fighting a cold... did I mention that airport contracted illnesses skyrocketed after NAFTA??!! We need a change in this trade model! ), but if people want to liveblog it post 5:30 pm or so in the comment section, you can follow the awesome display of senatorial argumentation at C-Span 2 at this link. 4:50 pm: Grassley is taking on the argument that the Peru FTA will worsen our food safety laws... we wrote a report on this. He argues that there hasn't yet been a challenge of U.S. food safety laws. This is a complex debate, but the WTO challenge of EU's food safety regime is case one that it could happen. If we ever GET some good food safety laws, you can bet this could happen to us under the WTO, NAFTA and Peru FTA laws. The Peru FTA opens up our current food safety laws - low as they are - to claims for compenstation from corporations. 4:40 pm: Grassley admits that the FTA will lock-in policies in Peru that current neo-liberal governments passed but which future governments will be bound to. 4:29 pm: Grassley cites the USITC report as justification for passing the Peru FTA. Keep in mind that this report, the official U.S. government assessment, shows our global trade deficit will increase with the Peru FTA. 4:26 pm: Despite the fact that you can't make an economic argument in favor, Grassley and Sen. Bill Nelson (D-Fla.) try to by saying Peruvians will buy tons of our exports. 4:22 pm: My feed went out for a while. Apologies. Sen. Chuck Grassley (R-Iowa), ranking member of the Finance Committee, endorsing the Peru FTA as expected. 3:46 pm: Dorgan: "This agreement will not harm the economic interests of the United States. I don't argue that. But it's an extension of a failed model." 3:40 pm: Dorgan reminding people of the radical, demogoguery of the claim that there is a connection between a net trade deficit and job loss in tradable sectors... sadly, this is still not widely conceded by the pro-NAFTA side, despite hundreds of years of economic theory. 3:19 pm: Debate is beginning. Vote will happen at 2:15 pm tomorrow. We'll be liveblogging the Peru FTA Senate vote, momentarily. And from numerology to astrology. What's your sign and what does it mean for Peru NAFTA? The Washington Post actually has a useful resource! A congressional vote breakdown by astrological sign! Who knew? So with some very sophisticated calculations (ignored non-votes, found percentage per sign opposing), it looks like Pisces are the most fair trade inclined with 43% of Pisces voting against the Peru NAFTA expansion. This is not surprising since according to AstrologyZone.com, Pisces "urge to relieve suffering in others is as strong as the life force and it is the single most important element of her nature to understand." And which sign are the biggest NAFTA supporters? Gemini has it with only 20% of Gemini House members opposing the Peru deal. Also not surprising. According to Astrology-Online.com, Gemini "is dual-natured, elusive, complex and contradictory. On the one hand it produces the virtue of versatility, and on the other the vices of two-facedness and flightiness." This about sums it up. Many of those who voted for the Peru NAFTA expansion did so despite earlier statements condemning the overreaching investor protections, NAFTA's agricultural rules and other NAFTA provisions that appear exactly as they did in NAFTA in the Peru agreement. So in the future, when we ask what your sign is, what we mean is are you more likely a NAFTA supporter or a fair trader? NOTE: Senate tally not yet in. Will of course revise this important report after the Senate vote, which is likely to happen the second week of December. "We were able, thank God, to take yes for an answer," said Democratic Caucus Chairman Rahm Emanuel (Ill.), a member of the Ways and Means Committee. Sweeney was meeting with foreign labor leaders in Berlin when the deal was struck on May 10, but both Rangel and Pelosi called to inform him of the news. At about midnight Berlin time, Sweeney spoke to the speaker on the phone. "This is a historic agreement," he told her. But moments later, as Pelosi walked into the Speaker's Dining Room to hold a news conference with Schwab and Treasury Secretary Henry M. Paulson Jr., she found herself facing hostile Democrats. A handful of lawmakers opposed to the trade pact with Peru -- including several Democratic freshmen who had campaigned on the issue -- had squeezed themselves into the tiny room on the Capitol's first floor and stared stony-faced at the speaker. "We're not against trade. We just want a trade system that works," said Rep. Betty Sutton (D-Ohio), a former labor lawyer who listened skeptically as the bipartisan group outlined its achievement. Many of Sweeney's fellow union leaders delivered even harsher assessments of the new trade accord. Change to Win, the six-million member federation that now ranks as the AFL-CIO's main rival, issued a news release on May 25 saying that the agreement "does not represent the basis for the type of new U.S. trade policy that this nation desperately needs." It is a dilemma that leaves Rep. Xavier Becerra (D-Calif.), a Ways and Means Committee member, wondering whether, in incorporating provisions on environmental and labor standards in the deal, his party has proven that it can deliver benefits to the working men and women who helped return it to power. "Trade has to be sold as something that's good for us. This deal goes partway towards addressing that. Whether it goes all the way . . .," the congressman said, his voice trailing off. A spokesman for Speaker Pelosi said Democrats would "want to see what agreement is negotiated," but did not rule out action on trade negotiating authority if the Doha deal is good enough to appease Democrats. A spokesman for Senate Finance Chairman Baucus said that if a Doha deal is negotiated, Baucus will confer with Schwab, House Ways and Means Chairman Rangel and others "to determine the appropriate next steps." the aide said. We heard a lot over the last year from a lot of clever Washingtonians about how if we just stopped "squawking" about the NAFTA expansion to Peru and gave Dems a pass to vote for this one, then we would avoid the "much scarier and totally different" NAFTA expansions to big, huge, giant, monstruous countries like Colombia and South Korea. As the argument seemed to go, "principle?! who needs principles, especially when your policy stance is so easy to understand! First, spend 25% more on labor monitoring, but lower your auto tariffs by a formula equal to the logarithim of the increased labor spending, and then multiply that by the number fewer of murdered workers in non-tradable sectors over the number of increased cut flower imports. Then, while covering your eyes with a Made in China American flag blindfold, throw a dart on a spinning Made in Mexico globe, and the small country 36 degrees due west is the country where it is OK to have a NAFTA-style trade agreement." Huh? What? As we argued previously, "what determines the effects of a trade agreement is not mainly the economic size of the country involved but instead the scope of the extraordinary corporate rights established under the agreement - rights that undermine U.S. domestic and foreign policy goals." josh Holland and David Sirota argue something similar here. Peru and Panama may not be huge, but they're big enough for a lot of corporations to think it was very important to extend NAFTA to them. I guess you don't need too much space to set up Halliburton Peru and then use the FTA's corporate rights to undermine Peruvian and U.S. laws. Or whatev' you want to do. And if matters of principle don't get your blood racing and hips shaking, then the political argument alone should be compelling. Let's say that 20% of members of Congress are firmly with fair traders on principle, while 30% are firmly against. (As it turns out, these are the percentages of House members that vote fair trade at least 80% and 0% of the time, respectively). That leaves about 218 members - of 50% of the House - that are picking and choosing their positions on fair trade depending on the bill, and are looking to outside pressure groups to define where the lines in the sand are. Elected officials don't necessarily have a long memory, but long enough to know that a model for one country should be just as good/bad for any other country. Or let's just say, I would love to be in on the lobby meeting where someone tries to convince a member otherwise. Like Twister, expect with tainted Peruvian ceviche and Colombian murderers on the red and blue dots. Rep. Charles B. Rangel (D-N.Y.) said Nov. 16 he is optimistic that Congress will consider the pending U.S. free trade agreements with Colombia, Panama, and South Korea next year but cautioned that it is still not a sure bet. Rangel, who chairs the House Ways and Means Committee, said that problems remain with all three agreements that will need to be resolved. He said that the agreement with Colombia would not be approved if it were brought before Congress for a vote today, calling the situation in the country "pretty heavy in terms of the violence against a whole lot of teachers and labor leaders." "We just don't have the votes," Rangel said. Rangel, speaking in an interview on CNBC's "Squawk Box," said that, with respect to the FTA with South Korea, it is "being negotiated by the Executive Branch [which] is trying to get some relief for our beef exports." But in the end, he said, he is optimistic that Congress will take up all three agreements next year, which some observers, however, have argued may be impossible because it will a presidential election year. "I'm optimistic [that] next year we'll take a look at all of these things," Rangel said, "and maybe the situation might change." This makes sense. After all, once you've forced tons of members of the caucus to vote for a flawed trade deal with one country, why would anyone think twice about voting for the exact same trade deal with another country? I'm not necessarily a member of the USTR fan club, but I think the fine team over there could probably bring some pressure to bear to reshuffle some Panamanian officials, Colombian statistical methods on assassinations, and Korean tariffs. Maybe that would be enough of a template for a new trade policy for some observers, but I don't think that such little tweaks are what really make the difference when we're facing a massive bleeding of high-paying jobs ever further up the skill and income ladder. And that brings me to my last and final musing of the day, on the argument for a "strategic pause" on trade. Jeff Faux from EPI has been raising this notion for a long time, and it must be a pretty powerful idea because presidential candidates are feeling the need to echo it, and from what I've read and heard, the Corporate Powers That Be within Dem circles are very scared of it. But 116 Democrats still opposed the agreement, including some freshmen from districts where trade has been blamed for taking away jobs and shuttering work sites. "Districts like mine represent the very worst of unfair trade -- jobs lost, economies devastated and lives shattered," said Rep. Phil Hare (D-Ill.). "Weary of more bad trade deals, last November voters swept fair-trade Democrats into office -- sending a clear mandate for a new direction on trade. And yet here we are. Voting on another one-sided, so-called free-trade agreement." Also see our e-mail alert for a summary and an action you can take to thank or criticize your member of Congress for his or her vote. Despite intense pressure and lobbying from some Democratic leaders, a massive corporate coalition and the White House, a majority of Democrats in the House of Representatives today opposed Bush's Peru NAFTA expansion agreement, echoing the American public's widespread discontent with the status quo trade policy. That a majority of Democrats opposed the Peru NAFTA expansion - theoretically the least controversial of Bush's remaining trade deals - will put the final nails in the coffins of any further Bush administration expansions of NAFTA to Panama, Colombia or South Korea. The opposition from 117 Democrats - including nearly three-fourths of Democratic freshmen and a majority of the party's committee chairs- shows that significant work remains to create a framework for trade agreements that can earn public support nationwide and thus bipartisan support in Congress. Despite the fact that many more Democrats occupy House seats, the Peru "free trade agreement" (FTA) obtained less Democratic support than the 2004 Australia FTA, the 2004 Morocco FTA, and the 2005 Bahrain FTA. The Peru FTA, because it fell short of approval by the Democratic majority, has proven itself an unacceptable framework for future trade deals. Hopefully the next trade debate in the Congress will be about how to create a new template for future trade agreements that will benefit the majority of Americans and thereby be able to win the support of the Democratic majority. In light of the 2006 elections, when Democrats took control of Congress after 37 freshmen successfully campaigned against the Bush trade agenda and replaced 37 anti-fair traders, many Americans likely will wonder how President Bush managed to eke out this rare victory and get a NAFTA expansion agreement through the Democratic-majority Congress. That a Democratic-majority Congress would pass a Bush trade agreement opposed by most Democrats may be especially puzzling since the vote came a week after Bush announced he would veto Democratic legislation to help workers who lose jobs to trade, and after Bush vetoes of Democrats' priorities - children's health insurance and anti-war legislation. This vote reveals that many in Congress understand that what determines the effects of a trade agreement is not mainly the economic size of the country involved but instead the scope of the extraordinary corporate rights established under the agreement - rights that undermine U.S. domestic and foreign policy goals. Trade per se was not the issue today. The Peru NAFTA expansion was opposed by so many Democrats because it establishes new corporate rights that promote offshoring of U.S. jobs; expose our environmental, food safety and health laws to challenge in foreign tribunals; empower foreign corporations to skirt Buy America and anti-off-shoring policies; provide Big Pharma with extended patent rights that undermine affordable access to medicine; and empower U.S. firms, such as Citibank, to demand compensation if Peru reverses its disastrous social security privatization. No U.S. labor, environmental, consumer, faith, family farm or development group supported this agreement, which also is opposed by both of Peru's labor federations, its major indigenous people's organization and its archbishop. The passage of the Peru NAFTA-expansion, which was overwhelmingly opposed in the United States and Peru, is bad foreign policy, bad domestic policy and egregiously bad politics. Public Citizen is a national, nonprofit consumer advocacy organization based in Washington, D.C. For more information, please visit www.citizen.org . 1:47 pm: Word is that there will be one vote switch from a yes to a no, meaning the count will be 117 no, 108 yes, 8 not voting. 10:42 am: House Trade Working Group co-chair Rep. Mike Michaud (D-Maine) pointing out that this Peru deal is not about whether Peru has a large economy, but about principle of standing up for Americans and not just for big corporations. "We embrace globalization so long as it lifts us all up." One word: rockstar. 10:10 am: Rep. Earl Blumenauer (D-Ore.) is from the other side of Oregon, but one that is no less anti Peru FTA. A recent news article highlighted the differences between the two reps.
10:07 am: Rep. Peter DeFazio (D-Ore.) gave a brilliant one-minute speech on Peru FTA. Peru deal is "by, for and about Wall Street." "The dollar is dropping like a rock. We're borrowing $2 billion a day from overseas to buy things that we don't make in America anymore. We've lost 4 million manufacturing jobs nationally, and 40,000 jobs here in Oregon due to so-called free trade policies. Millions of middle class Americans are seeing their pay go stagnate or decline. Our current trade policy is a dismal failure. It's a failed engine for America's economy." "Now along comes the Peru Free Trade agreement. The advocates say the burgeoning middle class in Peru are going to be a huge market for the goods that we don't make in America anymore. They tout the breakthroughs on modest environmental and labor provisions, but the destructive multi-national corporate-written chapter 11 core, that lead to the failure of NAFTA, CAFTA, and other trade agreements, remains at the center of this policy. This agreement is by, for, and about Wall Street, plain and simple. It's not in the best interest of American workers, the U.S. economy, or our national security." "If trade is the engine that drives our economy, we need an overhaul. Instead, with this bill, we're getting a new hood ornament, some side view mirrors and a misbegotten cousin of NAFTA as a trade policy." 10: 58 pm: The reps are signing off, and so are we, until around 10 tomorrow morn. Here's a pretty exciting global justice song, by none other than Anti-Flag, to sing you to sleep: "The WTO Kills Farmers." And so does the Peru FTA, dude. 10:55 pm: Rep. Betty Sutton (D-Ohio), a rockstar, and true heir to now-Sen. Sherrod Brown's (D-Ohio) seat. Representin' Lorain, mos def. 10:47 pm: Rep. Henry Cuellar (D-Texas), one of the CAFTA 15, almost got kicked out of office by Rep. Ciro Rodriguez, who challenged his pro-CAFTA vote, and went on to be elected on a fair trade platform in the neighboring district. It is very unfortunate that our own Republic’s Congress approved the signing of such a damaging treaty as the Peru FTA. Our democracy is still weak, due in part to the ongoing history of colonialism and racism that excludes meaningful input from affected indigenous communities who fight against exploitation and marginalization. All this leads us to place our hope in your colleagues and above all in you, the members of the U.S. Congress, to represent the best of democracy in our hemisphere and vote down this shameful Peru FTA. 10:39 pm: Rep. Phil Hare (D-Ill.) brought tears and applause to the room, arguing for the no vote. He said some pro-FTA character told him that he should vote for the deal but then talk to his constituents about currency manipulation. Hare said, "I better wear a football helmet if I try, cuz he's going to try to hit me." 10:32 pm: Rep. Melissa Bean (D-Ill.), one of the CAFTA 15, making her fourth consecutive vote for NAFTA expansion. 10:26 pm: Rep. Artur Davis (D-Ala.) gives some questionable dating advice: "Sometimes, you have to take yes for an answer." Oh wait, no he was just talking about the Peru FTA. 10:20 pm: Rep. Linda Sanchez (D-Calif.), one of the cofounders of the House Trade Working Group. Calls the "Peru FTA junker" the same "ol NAFTA lemon." "The actual benefits of NAFTA are about as real as the tooth fairy," mentions the promise that immigration would be reduced, but the opposite happened. "The enemy of the good is the bad," in response to the claim that "The enemy of the good is the perfect." 10:13 pm: Rep. Joe Crowley (D-N.Y.) sez he hasn't "been a purist on trade." That's true: he voted the fair trade position during the Clinton years, and then switched to an anti-fair trade position on 7/9 trade votes during the Bush years. (The two where the political pressure was the highest - CAFTA and Fast Track - he voted the fair trade position.) He's been one of the staunchest advocates of Bush's NAFTA expansion to Peru. 10:08 pm: Rep. Duncan Hunter (R-Calif.), the presidential candidate who once led the GOP charge against NAFTA, representing the GOP that 2-to-1 think the trade status quo is a bad idea. 10:03 pm: Rep. Bill Pascrell (D-N.J.), another very odd vote for the Peru FTA. Says he "voted against all of em" - referring to trade agreements. "This deal isn't perfect, no one this floor is either." 10:01 pm: Gotta love the Texas delegation. Rep. Jeb Hensarling (R-Texas) is part of the state's delegation that received by far the most corporate money in 2007 from the 13 corporations most interested in pushing the Peru FTA. 9:52 pm: Rep. Marcy Kaptur (D-Ohio) reminds folks that Pelosi and Hoyer voted FOR NAFTA. Reminds folks of how much people were excited about the Jordan FTA, which did not turn out as planned. Points out plenty of benefits for Newmont Mining and Citigroup if the thing passes. 9:41 pm: Rep. Walter Jones (R-N.C.), an all around GOP leader on trade, "where in the world is this country going?" "Some fat cat somewhere is going to make big bucks," in a great N.C. accent. 9:38 pm: Rep. Brad Sherman (D-Calif.) on enforcement: "President Bush has never inconvenienced multinational corporations.... IF you vote for this agreement, it's because you have faith in George Bush." 9:35 pm: Rep. Earl Blumenauer (D-Ore.), for the Peru FTA, possibly the most out of step with his constituents of any of the Dems, who have locked themselves down in civil disobedience at his Portland office. 9:26 pm: Rep. TIm Ryan (R-Wis.) talked about all the brilliant export growth to our FTA nations, failing to mention that our export growth rate to FTA countries as a whole are below that of non-FTA countries. Mrs. JONES of Ohio. I would like to thank the gentleman from New York for this opportunity to be heard. Mr. Speaker, I rise today against CAFTA because the agreement not only lacks significant labor protections for workers in the CAFTA countries, but also lacks necessary support for American workers. Charity begins at home. Let us not talk about our neighbors' workers. Let us talk about our own workers. With international trade comes economic pain. The United States has lost 2.8 million manufacturing jobs since January 2001. In Ohio, we have lost 200,000 jobs. Past administrations and Congresses have acknowledged a relationship between international trade and domestic job losses by having created the Trade Adjustment Assistance program in 1962 and subsequently expanding it. The program assists workers who have lost their jobs due to international trade by extending unemployment compensation and providing job training. Training is arguably the most important TAA component, as education and learning new skills is essential to finding a new job. During the Ways and Means Committee markup, I introduced an amendment that addressed that problem in order to keep up with worker demand. Unfortunately, that amendment was rejected. Additionally, during CAFTA markup, the Senate Finance Committee adopted an amendment that would have expanded TAA. Unfortunately, that provision was stripped from the CAFTA legislation. So right now there is nothing in TAA or in this final CAFTA legislation to assist American workers that have lost their jobs. Even a provision that Chairman Thomas originally included in the bill is stripped from the legislation. That study would have looked into whether TAA should be expanded as a result of any negative effects of CAFTA. So I ask, where is the commitment to the American worker in the CAFTA bill? NAFTA, CAFTA, SHAFTA for American workers. For the record, Bush says he'll veto TAA, and "necessary support for American workers" is not in the picture. 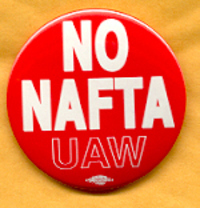 NAFTA, CAFTA, PUFTA, SHAFTA for American workers. 9:18 pm: Levin, without substantiation, says that the social security issue is without substantiation. But House staff, likely his own, admitted that such a case could be brought. 9:15 pm: Rep. Robin Hayes (R-N.C.), who nearly lost his seat lost year due to his tie-breaking votes on Fast Track and CAFTA, is in opposition. Smart guy! He points out that small business groups are frustrated that scarce congressional resources and time was spent pushing an "unpopular trade deal" with Peru, while ignoring China trade and other issues. 9:10 pm: Rep. Dennis Kucinich (D-Ohio) brings the pain, and bashes Citibank. 9:04 pm: Rep. John Tanner (D-Tenn.), who has voted for EVERY SINGLE EXPANSION OF NAFTA, and the anti fair trade position on 18/19 votes, made us drink twice in our drinking game: "ARE YOU WITH AMERICA, OR YOU WITH HUGO CHAVEZ?!" Not quite as soul stirring as "Mr. Gorbachev, tear this wall down!" but I'm always happy to have an opportunity to drink. 8:56 pm: Rep. Roy Blunt (R-Mo. ), the CAFTA czar, not surprisingly FOR the expansion of CAFTA and NAFTA to Peru. 8:54 pm: Rep. Dale Kildee (D-Mich.), from Flint, Mich., against the Peru FTA. Points out that not only Bush, but ALL presidents he has worked with from both parties do not bother to enforce trade rules. 8:50 pm: Rep. Jim Ramstad (R-Minn.), who has voted for 19/19 unfair trade votes, not surprisingly for the Peru FTA, and leaving Congress next year. 8:48 pm: Rep. Rahm Emanuel (D-Ill.), the NAFTA czar, not surprisingly FOR the expansion of NAFTA to Peru. He talks about how his part of the party talks about the need for pensions and other economic strategies, but only delivers on trade. 8:45 pm: Why are they making Jerry Weller, family member of dictators, the face of the "yes" vote? 8:43 pm: Rep. David Wu (D-Ore.) rejecting the FTA, saying human rights need to be put in with labor and environment rights. 8:25 pm: Rangel calls it "historic." "It's ridiculous to believe that we can create jobs without trade." "What we're talking about now is what is good for the country." Just announced by Rep. Steny Hoyer (D-Md.) that the bataan death march goes on until tomorrow morning. They'll do most of the debate tonight. 7:38 pm: Speaker Pelosi (D-Calif.) is taking the stand. "I have usually been on the other side of this debate than I am tonight." Tells stories about how she opposed China PNTR, increase in deficit and unsafe food. "When I saw an oporuntity for us to have labor and env standards as a core part of our trade agreement, it marked a difference from what even a Dem president was willilng to do on that score." Says she "hopes that the president of the US" will sign the TAA bill, even though he has said he will veto it. "Hopefully we can pass SCHIP" and other legislation, also things that Bush has also vetoed, as she explains why she is helping Bush out with the Peru FTA. "We cannot turn our backs on it... I don't want our party to be viewed as an anti-trade party." She says the Peru FTA "rises to the level of acceptance." Claims that the parliament of Peru passed the laws that were really passed by decree by the president, who is today crushing a labor strike. "The Peru FTA is not a big deal." 7:36 pm: Rep. Mike Michaud (D-Maine): "I didnt come to Washington to ignore my constituents back home." He is the leader rounding up no votes. Reminds folks that Bush is going to veto TAA. 7:33 pm: Rep. Sander Levin (D-Mich.), one of the architects of the deal that is the reason for why Peru FTA is being voted on, he calls the Peru FTA "the antithesis of CAFTA." But Levin supported agreements exactly like NAFTA and CAFTA with Chile, Singapore, Morocco, Australia, and Bahrain, not to mention his key role in ushering the China PNTR through in 2000 - which arguably has had the largest economic impact on the U.S. economy of any trade deal. 7:28 pm: Rep. Marcy Kaptur (D-Ohio): "This new direction Congress offers up more of the same... [saying you support the changed preamble language as a reason for supporting the Peru FTA] it's like saying you support the preamble to the Bill of Rights but not the rights themselves." Kaptur is really challenging Drier, who is talking about Whirlpool jobs (Whirlpool is a major Peru FTA pusher). Kaptur notes that this is the same Whirpool that that just offshored all the Maytag jobs in Iowa after buying it up. 7:26 pm: Rep. Richard Neal (D-Mass.) lauds the "progressive" advances in the Peru FTA, contrasting it with past trade deals. He doesn't mention that he voted against fair trade on 11/19 votes, including many NAFTA-style trade agreements and the WTO. 7:20 pm: Rep. Jerry Weller (R-Ill.) is speaking up as the face of the deal. Remember that he is retiring in part because of questions of his massive conflicts of interest on Latin America trade deals: namely, he has investments that benefit directly from CAFTA, and he is married into the region's leading dictatorial family after Pinochet. It's pretty rich that he is talking about democracy as the reason for passing the deal. 7:15 pm: Rep. Bart Stupak (D-Mich.) is expressing skepticism that much is changed with the Peru FTA, since the new labor and environmental provisions leave it up to Bush to decide whether to enforce them. Stupak is also concerned about the WTO food and consumer safety inspection regime that gets locked in with the Peru FTA, which prioritizes "free passage of food" over "proper regulation." 7:14 pm: Rep. Keith Ellison (D-Minn.) is speaking, a freshman who ran on this following platform: "I do not support trade deals that do not require fully enforceable protections for workers rights and the environment on par with protections for business. Additionally, I do not support the growing threat in these free trade deals to undermine the ability of our nation and our state to pass and enforce laws and regulations in the public interest. I would have voted against NAFTA, CAFTA, and the range of similar free trade deals that recent administrations have negotiated. Our nation needs an entirely different approach to our engagement with the global economy, a sort of global New Deal that protects jobs and democracy here, and contains specific mechanisms to raise wages and living standards in out trading partner nations. Public pressure for such a change is growing as recent polling has indicated, and I intend to be one of the prime movers in Congress for such a change.” Mentions that the Peru deal is going to help lock-in social security privatization in Peru, and displace rural peasants in Peru. Also mentions we should never have any more Fast Track, and that Congress should get to amend trade pacts. 7:11 pm: Rep. Lloyd Doggett (D-Texas) says "we have not fully achieved the job" of trade reform. Announces there's going to be a hearing on investor-state issues, and acknowledges that nothing on Peru FTA investor-state was changed by the deal between Bush and some Dems. 7:08 pm: Rep. Joe Baca (D-Calif.) is opposing the bill, arguing a very basic bottom line: is our trade policy creating net manufacturing jobs or not? He says not. 7:03 pm: Chairman Rangel taking the high road from the beginning, suggesting opponents are against trade and against Latin America. Rock and roll. 7:02 pm: Rep. Lincoln Diaz-Balart (R-Fla.) in favor of "free trade with free people," but he opposed NAFTA with Mexico. Also had a great song about it. 6:57 pm: Rep. Carol Shea-Porter (D-N.H.), who in her campaign said, "The Republican leadership has thwarted the will of the American people, traded favors with lobbyists in the halls of our Temple of Democracy, sent our jobs overseas and voted to allow our president to torture." Now, she's on the floor asking why in the heck we're in such a rush to pass these trade deals when factories in her district are closed. She cited today's Meyerson piece that made the same point. 6:51 pm: Wanna play a fun drinking game? How many times will "Hugo Chavez" be mentioned during this debate? Drier has already said it several times. Not mentioned is the fact that Hugo Chavez rose in power in response to the implementation of neo-liberal policies in Venezuela. Message? Drier HEARTS Chavez. Drier also praises "socialist" Alan Garcia, who used to follow "bad" economic policies, but today (on the day of the Peru vote) broke a strike by workers. Not super bright, and not super socialist. 6:48 pm: Rep. David Drier (R-Calif.) is saying people that are against this trade deal are AGAINST U.S. EXPORTS, even though the U.S. International Trade Commission, the bipartisan and official source for trade projections, estimates that the U.S. global trade deficit will go up $100-300 million if the Peru FTA is signed. (A LITTLE MATH: EXPORTS - IMPORTS = TRADE DEFICIT.) He also mentioned that he wants to push forward down the slippery slope to the Colombia FTA, exactly what a lot of Washington insiders said would not happen if we just quietly let the Peru FTA pass. 6:34 pm: Rep. Doris Matsui (D-Calif.) is beginning the one hour debate on the rule, by celebrating the TAA bill passed last week in the House. Didn't mention that Bush will veto it. So, get ready. The debate on the long awaited Bush NAFTA expansion to Peru may start as early as 11 am this morning, although it could be closer to or after noon. The Rules Committee has published its rule on the bill, which will allow for 3 hours of hot Rangel-on-McCrery-on-Michaud-on-Ron Paul(?) action. This final proceeding, during which no amendments are allowed, brings to a close the Fast Track Deathclock on Peru. AND THERE'S STILL TIME TO CALL YOUR MEMBER NOW! But why the Democratic rush on trade? Globalization does pose real challenges to working- and middle-class Americans. Democrats should wait until they're in a position -- say, in 2009 -- to begin to restore some security to Americans' economic lives before they return to cutting trade deals. Their electoral prospects, and the nation's economic prospects, demand no less. The international trade rules even limit our government's ability to investigate imported products when there is evidence of contamination, while simultaneously giving special rights to corporations to sue governments when environmental policies threaten their profits. Does this make any sense? Of course not. But what makes even less sense is that Congress, including some leading Democrats, are right on the verge - not of reforming this trading system - but instead extending it yet again. Even though the public - from liberals to conservatives, from Democrats to Republicans - overwhelmingly supports trade policy reform, key Democratic leaders have decided to work with the Bush administration to pass a NAFTA-expansion deal with Peru. Similar deals with Panama, Colombia and Korea are in the pipeline. Democratic leaders claim they got "major environmental concessions" from Bush in these latest deals. But these concessions barely changed the structure of the deals, and don't fix the most glaring environmental problems. For example, a major Peruvian environmental association recently wrote to Congress asking for a vote against this trade agreement because it is expected to lead to massive oil and gas exploitation of the fragile Amazon Basin. And there is still no right to know if products are green or not. The free trade agreement with Peru, like the other NAFTA-style deals, takes us in the wrong direction and won't help us "be or buy green." In order to assure that our emerging "green consciousness" is encouraged to thrive, we must insist on stronger pro-environment provisions in all new trade agreements, starting with the pact with Peru. But the trade group for smaller farms, Rocky Mountain Farmers Union, said the agreement would hurt farmers by flooding the U.S. with inexpensive goods. "We feel like most of these trade agreements pit one farm against another," said Benjamin Waters, government-relations director for Rocky Mountain Farmers Union, which represents about 20,000 farms in Colorado. A trade group for independent cattle ranchers and feedlots said it's concerned that the agreement would not protect consumers. Beef producers in surrounding countries could ship cattle to a Peru slaughterhouse where it would be labeled as a product of Peru and shipped to the U.S., said Bill Bullard, chief executive of R-Calf United Stockgrowers of America, a Montana trade group with about 1,000 Colorado members. Moreover, the agreement helps multinational corporations like Swift & Co. increase their market share, which gives them increased power, he said. "They're seeking lower-cost production areas from which to procure live cattle beef," Bullard said. That hurts smaller U.S. producers, he said. The fact that the Peru trade deal is supported by a bipartisan group of insiders, including George Bush and senior officials from the first Clinton Administration – many of whom are now lobbyists, corporate lawyers, and business consultants – should be proof-positive of why members of Congress should join with me and oppose this deal. The benefit to corporate lobbyists from both sides of the political aisle will come only at the expense of hard-working families. [The Peru Free Trade Agreement] could split the party this week, as the full House of Representatives considers the first vote on a free-trade agreement since the 2006 election, when Democrats won control of both chambers of Congress. The party leadership supports a Peru pact because it contains stronger labor and environmental standards than past agreements. Yet many rank-and-file Democrats, including freshmen lawmakers who assailed the dangers of free trade for American workers on the campaign trail last year, are skeptical. Despite the unsatisfactory record of NAFTA as a "free trade" model, the neoliberal economic policy has continued its march forward in the same direction. This week, the Democratic-led Congress will have its first vote on the Bush administration's latest NAFTA-like expansion, the US-Peru bilateral free trade agreement. The United States-Peru Trade Promotion Agreement being considered by Congress continues the practice of overseas outsourcing and job erosion, among other labor and environmental concerns, says Rep. Steven Rothman, D-Fair Lawn, in a press release. It's time to get the other Dems on the record! Find out how here. And now for this week's trade on the campaign trail. Last Saturday former Sen. John Edwards announced his opposition the Peru Free Trade Agreement (FTA) - read our previous post. Former Governor Mitt Romney announced his "new vision" for American trade policy, complete with powerpoint presentation. Governor Romney would seek to bring together nations committed to open markets and playing by the rules in the largest ever Free Trade Area, and go beyond traditional trade to promote high standards in areas critical to U.S. competitiveness. The Reagan Zone Of Economic Freedom would act as an alliance working together internationally, in the World Trade Organization and elsewhere to push reforms and work cooperatively in areas like labor and the environment. "Smooth talking Mitt Romney is in for a big surprise if he thinks the American people are looking to trade on Bush Republican for another next year," said Democratic National Committee spokesman Damien LaVera. "President Bush's failed trade and economic policies have hurt America's working families and we simply cannot afford four years of more of Bush Republicans exporting good jobs." We decided to try to keep the country safer by inspecting containers that come into this country, and who lobbied against it? The biggest company in America -- Wal-Mart. We've had trade deals that have cost us millions of jobs, and what did America get in return? We got millions of dangerous Chinese toys. These things are all evidence of a system that doesn't work. There's got to be people watching this at home saying, "Hey, you haven't talked about me losing my job because of NAFTA." Well, I'll cancel NAFTA and -- and -- and the WTO and have trade that's based on workers' rights, human rights and environmental quality principles. As her party's front-runner, Clinton's decision could influence how many other Democrats view the Peru pact. Clinton has called for the South Korean agreement to be renegotiated because of its auto provisions, which many Democrats believe are tilted in favor of Seoul. She has also called for all U.S. trade agreements to be reviewed every five years. When the Wall Street Journal says "this month," what they actually mean is this Wednesday. That's it for this week. Stay tuned for more Trade On The Trail. It is old news that the House Ways and Means Committee supports the Peru free trade agreement (FTA) and that this committee’s votes on trade agreements often do not reflect the views of many other rank-and-file members of Congress. However, not one Democratic base group supports this expansion of NAFTA to Peru, and scores of unions and environmental, consumer, Latino civil rights, faith, development and family farm groups oppose the deal, along with Peru’s two labor federations. Democrats won their majority in the 2006 midterm election in no small part due to challengers who successfully campaigned against the NAFTA status quo, and voters replaced NAFTA-supporting incumbents in 37 congressional seats across the country. For these majority-making freshmen, many in vulnerable seats, Halloween offers no scare as frightful as the prospect of a Democratic-majority Congress passing another Bush NAFTA expansion agreement opposed by many of their key constituents. That the agreement may not obtain a majority of House Democratic votes despite it being supported by the House speaker, majority leader, whip, caucus chair and powerful Ways and Means committee leaders is clear evidence that the Peru FTA is both bad policy and bad politics. "I grew up in Carolina mill towns and so I've seen firsthand the devastating impact trade can have on workers and communities," said Edwards. "Presidents from both parties have entered into trade agreements like NAFTA and the WTO promising that they would create new jobs. Instead, in recent years we've lost millions of manufacturing jobs, seen wages stagnate, and run up larger and larger trade deficits. "In short, this agreement does not meet my standard of putting American workers and communities first, ahead of the interests of the big multinational corporations, which for too long have rigged our trade policies for themselves." The criticism was welcomed by the deal's opponents, who include the heads of Peru's labour movement and Pedro Barretto, the country's archbishop. Mr Edwards singled out "provisions that could allow US banks to demand compensation if Peru reverses its disastrous social security privatisation". He also offered a broader critique of the US approach to negotiating trade deals modelled on the North American Free Trade Agreement. "All of these agreements provide the expansive investor rights that literally create incentives to relocate US jobs overseas," he said. "Stephen Colbert claims to represent a new kind of politics, but today we see he's participating in the slash and burn politics that has no place in American discourse. The truthiness is, as the candidate of Doritos, Colbert's hands are stained by corporate corruption and nacho cheese. John Edwards has never taken a dime from salty food lobbyists and America deserves a President who isn't in the pocket of the snack food special interests." Also, a great post at Daily Kos outlines everyone's positions (other candidates, labor, etc.) on the Peru FTA. "Some of these things that come up under free trade are just amazing"
A group of U.S. community organizations have entered the fray over free trade, warning that fuzzy language in a trade accord with Peru could penalize that country if it tries to fix its controversial, privatized Social Security system. Citibank Overseas Investment is the largest single investor in ProFuturo, which is one of the leading pension fund providers in Peru. The letter warned that ambiguous wording in the financial services and investment chapters in the trade agreement could potentially open the way for Citibank to ''claim a large monetary award'' in international tribunals. You can find a copy of the letter here, signed by Americans for Democratic Action, Arizona Advocacy Network, Campaign for America’s Future, Citizen Action/Illinois, Citizen Action of New York, Citizen Action of Wisconsin, Colorado Progressive Coalition, Connecticut Citizen Action Group, Florida Consumer Action Network, Georgia Rural Urban Summit, Iowa Citizen Action Network, Labor-Religion Coalition of NY state, Maine People's Alliance, Michigan Citizen Action, Missouri Progressive Vote Coalition, NDPeople.org, NETWORK: A National Catholic Social Justice Lobby, New Hampshire Citizens Alliance, New Jersey Citizen Action, New Mexico PACE, Oregon Action, Progressive Maryland, Public Citizen, Rhode Island Ocean State Action, Tennessee Citizen Action, United Vision for Idaho, USAction, Washington Community Action Network, and West Virginia Citizen Action Group. Their conclusion? Peru FTA is not only a threat to the future well-being of Peruvian citizens, but also a dangerous precedent for the United States and world. Social Security, and the essential protection it provides, should not be limited by U.S. trade policies – either in the United States or in our trading party countries. We urge Congress to reject the Peru FTA and begin a course toward a fair trade model. This follows an excellent report from Bill Moyers Journal last Friday on the issue. Citibank tells us what it likes about the Peru FTA here, and Bush's financial corporation trade advisory committee likes the precedent being set here. More background can be found at my piece over on Alternet. Check out this latest letter from major environmental groups (PDF) opposing the NAFTA-expansions for the incentives they give for oil corporations to drill in the Amazon Rain Forest. And a UNITE-HERE letter that blasts the deal and calls out the labor provisions that everyone from the U.S. Chamber of Commerce to Human Rights Watch says are unenforceable. Rep. Mike Michaud (D-Maine) gave a talk Monday on the House floor noting the Chamber support and calling the Peru deal "the same old model with a little fancy title" (see full statement after the jump). The only U.S. beneficiaries, observed [Council President] Kearns, are the multinational companies that value these trade deals as opportunities to outsource more American factories and jobs. Up on the Hill, you hear a lot of people laughing about how revealing it is that you have to reauthorize the burial insurance right before passing more job-killing trade agreements. UPDATE 3pm: Just Foreign Policy's Bob Naiman has a great summary of the issues involved over at Daily Kos. "This is the best trade agreement ever for people who care about worker rights. This will be a model for agreements in the future." "Earl's totally out of touch with Portland. He's viewed as someone who, if enough political pressure is there, he will sometimes do the right thing on trade, but when it comes down to it, he votes for big business interests." "I know he fundamentally believes trade is essential for Oregon, but at the same time he is interested in making sure labor and environmental protections are adhered to." "Sooner or later the policymakers are going to wake up to the reality that the American people know, which is we are undermining the most successful system in the world, that brought the largest middle class in the world, with our trade policies. Unfortunately, a small percentage of Democrats and a large majority of Republicans are still blind to this because the corporations love what's happening." Funny thing about that... neither the AFL-CIO or Change to Win is supporting the agreement. And Peru FTA critics are not calling for a moat around the economy. In fact, leading Peru FTA opponents announced legislation to make permanent poor countries' duty-free access to the U.S. market. I meet these workers all across Illinois, workers whose jobs moved to Mexico or China and are now competing with their own children for jobs that pay 7 bucks an hour. In town meetings and union halls, I've tried to tell these workers the truth--that these jobs aren't coming back, that globalization is here to stay and that they will have to train more and learn more to get the new jobs of tomorrow. But when they wonder how they will get this training and this education, when they ask what they will do about their health-care bills and their lower wages and the general sense of financial insecurity that seems to grow with each passing day, I cannot look them in the eyes and tell them that their government is doing a single thing about these problems. That is why I won't vote for CAFTA. Hard to see the government has really stepped up to the plate since 2005. If anything, things have gotten worse, as Bush showed some Texas will and vetoed the Dems' most ambitious domestic policy initiative - expanding kids' health care insurance. It seems very strange to reward that veto with support for Bush's plan to expand NAFTA to Peru. Hat tip to Sirota for the heads up. UPDATE: JES' A REMINDER for the sake of context: Democrats came to office in 2006 by responding to their base and swing voters' demands for fair trade, and the latest polling shows this will be an important issue in the general election as well. And just take a looksie here to see how every important base group for the Democratic Party is opposing the Bush's Peru NAFTA expansion, which replicates and expands on NAFTA's harmful provisions. And the kind folks at CEPR have just laid out a reminder of the economics of our status quo trade policy, and why the Dems' working class base have not benefited from these policies. National Latino Congreso to Congress: Oppose Bush's NAFTA Expansions! Los Angeles, CA – Reflecting on the root causes of poverty and migration in Latin America, the National Latino Congreso has unanimously approved a resolution rejecting new trade agreements based on the North America Free Trade Agreement (NAFTA), and calling on the U.S. to change its international economic policies, which so far are largely to be blamed for producing wealth and income inequalities abroad, as well as at home. In the case of Latin America, policies promoted by the U.S. have also resulted in the impoverishment and displacement of millions of rural inhabitants. The resolution specifically condemns national lawmakers who are attempting to push anti-immigrant legislation while continuing to push for expansion of trade and economic policies that force families to emigrate in the first place. More than 1,000 Latino leaders present applauded the passage of the resolution, calling it an important step towards addressing the obvious link between current U.S. trade and economic policies, and migration. WASHINGTON, D.C. – The depth of public opposition to North American Free Trade Agreement (NAFTA)-style pacts was demonstrated Sunday by Costa Rica's massive "no" vote to CAFTA despite a intensive campaign led by the country's president, months of deceptive radio and television advertising in favor of the pact, and a threatening statement issued Saturday by the White House, Public Citizen said today. The strong vote against CAFTA likely will fuel growing opposition to another Bush proposal now before Congress to expand NAFTA to Peru. The Peru Free Trade Agreement (FTA) contains the same foreign investor privileges, service sector privatization, agriculture and other provisions that fueled Costa Rican public opposition. "That nearly half the public in Latin America's richest free-market democracy opposed CAFTA despite the intensive campaign in favor of it should end the repeated claims that pushing more NAFTA-style free trade deals is critical to U.S. foreign policy interests in the region or helps the U.S. image," said Lori Wallach, director of Public Citizen's Global Trade Watch division. "This vote also debunks the claim that these pacts are motivated out of U.S. altruism to help poor people in trade partner countries, given that many of the people in question just announced that they themselves don't want this kind of trade policy. This policy, supported by the elite, will help foreign investors seize control of their natural resources, undermine access to essential services, displace peasant farmers and jack up medicines prices." "Following transmittal by the President of a proposed agreement, its implementing bill, and required supporting materials, the implementing bill... must be introduced in both Houses by the respective majority leaders on behalf of themselves and the minority leaders." "Following introduction of the implementing bill, it is to be referred, by the Presiding Officer in each House of Congress, to... the Ways and Means Committee and the Finance Committee... and possibly others." "No amendments in the implementing bill are permitted... in the House of Representatives or the Senate. This limitation applies to committee consideration and in connection with a vote by either full chamber." "Automatic Discharge. Committees may not consider the bill for more than 45 legislative days... after it is first introduced. If the implementing bill is not reported out of the committees to which it was referred within that time frame, those committees are automatically discharged and the bill is placed on the appropriate calendar." "Floor debate is limited in each House of Congress to 20 hours." "A vote on ultimate passage of the bill must occur in the House of Representatives and the Senate within 15 legislative days of the bill being reported out of the relevant committees or the automatic discharge of those committees. Thus, the maximum period for congressional consideration of a fast-track implementing bill is 60 legislative days, bu, of course, a final vote could occur in less time." But there's just a teeny weeny pwoblem. At Wednesday's caucus meeting, as we reported yesterday, Pelosi "has promised Democrats reluctant to vote for a free trade agreement with Peru that they will first have the opportunity to approve an expanded trade adjustment assistance program for US workers who lose their jobs because of trade (WTD, 9/26/07)." But, as Inside U.S. Trade reported today, there's no such bill. "It is unclear how quickly a TAA bill can advance. Ways and Means Trade Subcommittee Chairman Sander Levin (D-MI) said this week he hoped to circulate a draft to members next week in order to promote discussion. The House approved a short-term extension of TAA on Sept. 25, five days before the program’s expiration and a week after the Ways and Means Committee approved it." There is no reason that Bush had to drop the implementing legislation last night, AFTER it was reported that Pelosi wanted to go FIRST with trade adjustment assistance, which hasn't even been prepared yet. Whadda yinz think? Is Bush reminding pro-Deathstar Democrats whose NAFTA expansion this really is? In any case, as we've reported many times, there shouldn't be any deal-making around TAA. First of all, it's cruel to deny assistance to the few workers who are able to qualify (a small minority of all trade-displaced workers). This should be done regardless of any other legislation. Then there's the issue that the biggest negative economic impact of our trade legislation is on the REST of the labor force - the ones that don't lose their jobs but see their wages stagnate as a result. Finally, there's the perils of the deal-making process itself . Members should really stick to principle on this one, not only because it's the right thing to do politically and policy-wise for Peru and the American people, but also because 90% of promises made for votes on trade pacts do not work out as planned. The wires and industry publications were alight following yesterday afternoon's Democratic Caucus meeting, which was called by the House Trade Working Group to express their outrage that some Democrats are considering supporting Bush's NAFTA expansion to Peru. If the Peru bill passes, Democrats face the real possibility that NAFTA expansion will be one of the few pieces of legislation (on any issue) that actually makes it through both chambers that is not watered down in the process and is signed into law during their control of Congress. This after losing control of Congress after supporting NAFTA in 1993-94, after 90% of the party voted against the virtually identical CAFTA in 2005, after taking control of Congress on a fair trade platform in 2006, having gotten not too much progressive legislation actually signed into law in 2007, and heading into a recession in 2008. Karl Rove's smile is surely lighting up some dark corner of Texas. After opposing 95% identical CAFTA, Pelosi defends NAFTA-CAFTA expansion to Peru. From Congress Daily PM: "House Speaker Pelosi defended her support of the U.S.-Peru free trade agreement to a restive Democratic Caucus Wednesday, as the trade deal looks more and more likely to be on the House floor in October... Pelosi told the caucus she had proved her "bona fides" on trade through past opposition to trade agreements, and said the Peru deal was a case where Democrats need to "take yes for an answer," according to one participant... New Democrat Coalition Chair Rep. Ellen Tauscher, D-Calif., said the group will whip their members to support the deal, but said it has not been determined whether the coalition will formally score the vote. That might be decided at the group's weekly meeting today, she said. Michaud said he and other opponents will build opposition, including through reaching out to Republicans." We get wheeling and dealing on a program that benefits very few Americans. Washington Trade Daily: "House Speaker Nancy Pelosi (D-Calif) has promised Democrats reluctant to vote for a free trade agreement with Peru that they will first have the opportunity to approve an expanded trade adjustment assistance program for US workers who lose their jobs because of trade (WTD, 9/26/07). The speaker told Democrats yesterday she will bring legislation expanding TAA to the floor before voting on the US-Peru free trade agreement - or any other trade deals, a Democratic aide told WTD. The announcement came at a closed-door meeting of the Democratic Caucus on the Peru FTA. At that meeting, a number of members spoke out - âoften in passionate languageâ - according to one aide, including free-trade critics Reps. Phil Hare (Ill), Mary Kaptur (Ohio), Michael Michaud (Maine), Linda Sanchez (Calif) and Brad Sherman (Calif)." We have some very surprising reversals. The Hill reports that 93% fair trade vote record Rep. Bill Pascrell (D-N.J.) is supporting Bush's Peru NAFTA expansion: ""I think I've voted for one trade deal since I've been here," said Pascrell, a six-term lawmaker who joined Ways and Means this year. At the time, Pascrell's appointment raised eyebrows from some in the business community since Pascrell is seen as a reliable vote against trade deals, not for them. "Some of my friends say: 'What did you do when you got on Ways and Means? Did you drink the Kool-Aid?" quipped Pascrell... Rep. Hank Johnson (Ga.), one of 41 Democratic freshmen who called for a shift in trade policy, has said trade was critical to Democrats regaining their House majority earlier this year." And a healthy dose of courage from freshmen members. Congressional Quarterly writes: "Trade opponents in the caucus, however, say that while the new standards represent improvement, the agreement remains flawed. They contend that the Bush administration cannot be trusted to enforce the new standards and that Democratic leaders are pushing the pacts too quickly. In a recent conference call, Trade Working Group member Phil Hare, D-Ill., said Democrats should postpone action on pending agreements until a new president takes office. Domestic politics exert a strong influence on opponents, many of whom say constituents voted for them to change U.S. trade policy. "I ran on this issue,' Hare said Wednesday, âand I canât run away from it.'" More than two dozen people protested the NAFTA-expansion to Peru in Rep. Earl Blumenauer's (D-Ore.) Portland office earlier this week. Four protestors, who refused to leave until Blumenauer committed to vote "No" on the Peru NAFTA expansion, were arrested. The Portland Central America Solidarity Committee (PCASC) has more details on the protest and a link to a video interviewing labor and campesino leaders who know passing this deal will cause irreparable harm in Peru. Ignoring the real concerns that were voiced at the protest - including the impoverishing impact of this deal on hundreds of thousands of Peruvian farmers - the Ways and Means Committee (presumably with Blumenauer present although there is no recorded vote count) approved the NAFTA expansion to Peru by "voice vote" at yesterday's "mock mark-up." Is Blumenauer helping the Bush administration pass a NAFTA-style agreement to Peru instead of standing with his constituents who want to see real change in our trade policy? Let us know your thoughts. WASHINGTON, DC-Members of the House Trade Working Group today released the following statements in response to the “mock markup” of the U.S-Peru Free Trade Agreement (FTA) by the House Ways and Means Committee. Under the rules of fast-track, the markup is nonbinding and the agreement cannot be amended. The U.S.-Peru FTA, which follows the same flawed model as NAFTA and CAFTA, has not had a formal hearing since the White House and Congress announced a deal on labor and environmental standards in May. Just when I was beginning to think that last week's Senate Finance Committee's 18-3 approval of NAFTA expansion to Peru was a mockery of the millions of voters that voted for fair trade candidates in last year's elections (not to mention the Peruvian worker and peasant groups that have spent years trying to block the deal), I realized this morning that the mockery had just begun. The House Ways and Means Committee just held its "mock mark-up" moments ago, and boy was it amped up on the "mock" factor. Without discussion, debate, amendments or input from most members, the Ways and Means Committee "approved" the NAFTA expansion to Peru by "voice vote," meaning none of the positions of the committee's 24 Democrats and 17 Republicans were recorded, and the committee chair just decides subjectively or based on the volume of member's voices whether they think the ayes or the nays won. Witnesses said that the call for "nays" was so rushed that a sneezing member might have missed it. As we've written elsewhere, Fast Track is an inherently undemocratic process that undermines the Founding Fathers' intention that Congress not only write but actually BE RESPONSIBLE for trade policy. Since Congress has voted through Fast Track (first in 1974) to take its hands off the trade policy steering wheel, the United States has run a ballooning trade deficit and wages have scarcely grown - thanks in large part to our trade policy. But, if only to show constituents that they care, the congressional committees responsible for trade have often held a hearing on trade deals right before the "mock mark-up," followed by the "mock mark-up" where they debate and propose some amendments. In the past, important labor, development and environmental amendments have been proposed by members - and then often ignored by Bush or the previous GOP committee chairs. But it moves the debate forward and gets members (and the president) on the record nonetheless. But today, nada. Bienvenidos al Deathstar, companeros. Hat tip to the Oregon Fair Trade Campaign, who pointed us to the film below, a well-produced video full of interviews with Peruvian labor and campesino leaders on why they oppose the U.S.-Peru FTA. Definitely worth your 10 minutes. As Bloomberg has reported, Sen. Debbie Stabenow (D-Mich.) stood strong for fair trade on the Senate Finance Committee to vote against the Peru NAFTA expansion. She was joined by Sens. Orrin Hatch (R-Utah) and Jon Kyl (R-Ariz.), who are concerned that the FTA's intellectual property protection provisions are not restrictive enough. Democrats: Baucus (Mont. ), Rockefeller (W.V. ), Conrad (N.D.), Bingaman (N.M.), Kerry (Mass. ), Lincoln (Ark. ), Wyden (Ore.), Schumer (N.Y.), Cantwell (Wash.), and Salazar (Colo.). GOP: Grassley (Iowa), Lott (Miss. ), Snowe (Maine), Smith (Ore.), Bunning (Ky.), Crapo (Idaho), Roberts (Kansas), and Ensign (Nev.). Oxfam tells Congress: No NAFTA expansion to Peru! I am writing to you regarding the imminent Congressional action on the recently modified free trade agreement between the United States and Peru, referred to as the US-Peru Trade Promotion Agreement (PTPA). Oxfam America is asking you to oppose this trade agreement because it will undermine development and poverty reduction in Peru. Oxfam believes that trade can contribute to economic growth and to the reduction of poverty in developing countries, provided that trade agreements take into account the economic and social disparities between trading partners and include rules that are aligned with development and poverty-reduction goals. As originally negotiated, the PTPA failed to achieve these purposes. The modifications subsequently negotiated by the Democratic leadership and now included in the agreement, while taking important steps toward making trade work for people living in poverty, remain insufficient to overcome its adverse effects on development and poverty reduction in Peru. The PTPA’s adverse effects on Peruvians will outweigh its limited benefits, which will primarily accrue to a limited group of exporters whose current US market access will be made permanent. Meanwhile, the agreement will harm many thousands of Peru’s small farmers who will be forced into an unfair competition with subsidized US agricultural exports. The PTPA will also restrict Peru’s ability to regulate foreign investment to ensure it serves national development. The bottom line is that the PTPA is not a fair trade agreement for the poor in Peru and should be rejected. There will be significant displacement of Panamanian producers (many of whom are rural poor) of corn, rice, pork and poultry, as U.S. goods flood in. Remember that NAFTA's similar provisions led to Mexico's massive rural displacement - and then U.S. immigration. That even though there is very little new U.S. tariff cuts for Panama, that the NAFTA expansion "could create additional incentives for investment in export-oriented industries in Panama, as it would effectively make CBERA and GSP duty-free treatment permanent.” (at xvi, xvi) This is the avenue through which additional U.S. job displacement could occur. So the two-way street argument is pretty flawed. Corporations are looking to lock-in an off-shoring arrangement via an FTA, even though the import of products is already duty-free. That the Deathstar Deal labor provisions are unlikely to lead to any on the ground improvements in workers' well being in either country. "The labor provisions contained in the proposed U.S.-Panama TPA text likely would have minimal impact on the U.S. or Panamanian labor markets or on U.S.-Panama trade because of the chapter’s focus on the enforcement of existing labor regulations and the ILO Declaration on Fundamental Principles and Rights at Work and Its Follow-up (1998) (ILO Declaration), which the United States and Panama are already committed to observe as members of the International Labour Organization (ILO)." at 5-22, emphasis added). That consumers are very right to be concerned about the NAFTA expansion to Panama's watering down and weakening of our already fishy food safety standards. "U.S. imports from Panama were fairly concentrated in a few product categories, primarily fish and crustaceans, including shrimp, tuna, and frozen fillets of fresh-water fish; ... Fish and crustaceans accounted for more than 30 percent of total U.S. imports from Panama in 2006." As the Senate Finance Committee holds a hearing on the Peru FTA, grassroots opposition to the deal grows. We just put out this release. WASHINGTON, D.C. - A growing number of constituency groups key to the Democratic base are calling on Congress to oppose a proposed free trade agreement (FTA) that would extend the NAFTA-CAFTA model to Peru, Public Citizen said today, as the Senate Finance Committee held a hearing on the pact. The whole release is after the jump. Big Biz: Labor Rights are "Pretty Nuts"
For a little more background into the distinction between the conventions and the declaration, and why a lot of folks are calling for the former, see Human Rights Watch's short and sweet report from June (PDF). The same article also said that the Chamber wants to expand "NAFTA into the Free Trade Area of the Americas, 'if for no other reason to send a message around the world that we’re not going to let everybody else in the world come in and take over the Americas.' Donohue noted that other countries are signing FTAs in Latin America." Good to know the Monroe Doctrine is alive and well! In a related event, two Peruvian labor unions in an Aug. 20 letter to members of Congress said that the U.S. and Peru would have to go further than they appear willing to do in order to achieve real reform. The letter, signed by leaders from the Central Unitaria de Trabajadores del Peru and the Confederacion General de Trabajadores del Peru, argues that the labor deal struck between the U.S. and Peru is insufficient because new labor obligations refer only to the 1998 Declaration on the Fundamental Principles and Rights at Work of the International Labor Organization, but not the eight specific ILO conventions on fundamental labor rights.